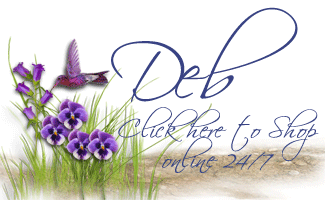 Ribbons and Punches and Dies – Oh My!! Today is Tuesday – so that means it’s time for new Weekly Deals! If your looking for some tools of the trade, or embellishments to jazz up your projects, this is a good week for you! Stampin’ Up! also released a new stamp set today that is super-duper adorable, plus it satisfies the ‘Angel Policy’ requirement (where you must have an approved ©Stampin’ Up! stamp on any product you have made with SU! products, and are re-selling). 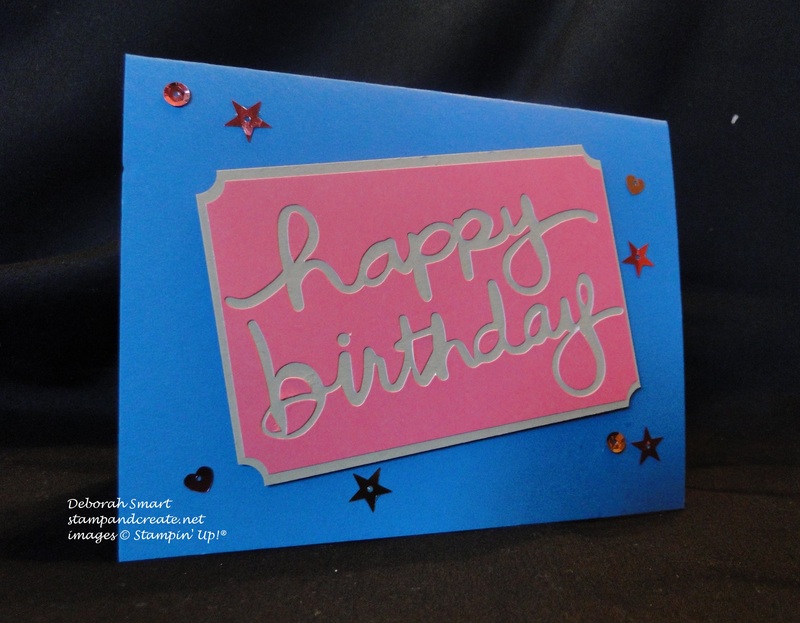 One more piece of sales news to share with you, then I’m onto sharing some cards…. 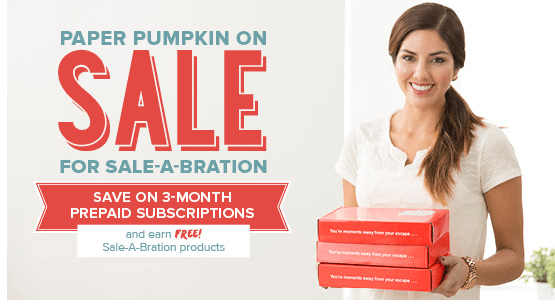 During Sale-a-bration, you know you can earn FREE product with every $60 order, right? Well, how about getting a Sale for 3 months, PLUS FREE product? To place your Paper Pumpkin subscription order, simply CLICK HERE, fill out your information – remember to identify ME as your demonstrator – and your monthly craft escape will be on it’s way! Speaking of Paper Pumpkin – here comes the card sharing! 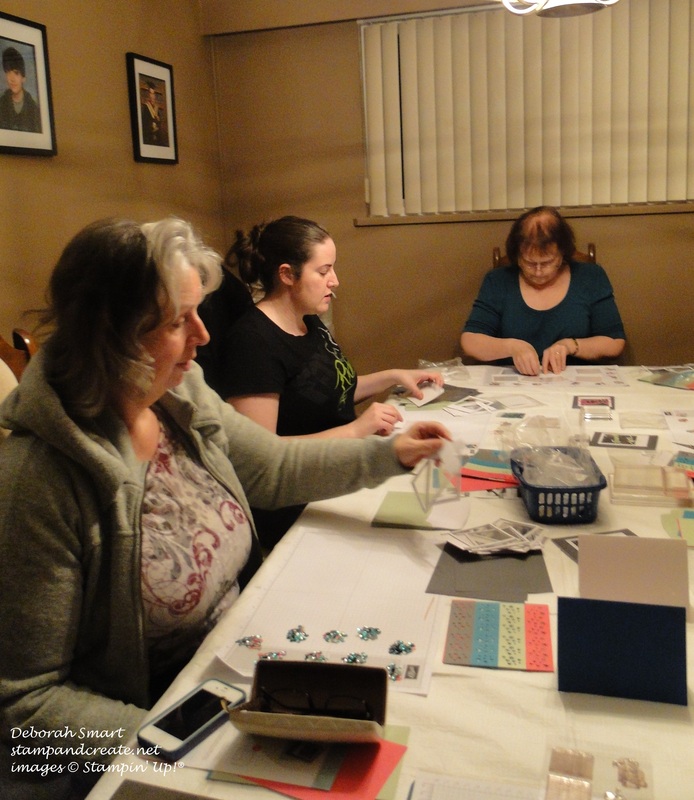 Last Friday I held a class based on the December Paper Pumpkin; I had received my full kit as a subscriber, and thought it was so cute (and I loved the name “All Shook Up”) that I wanted to share it! 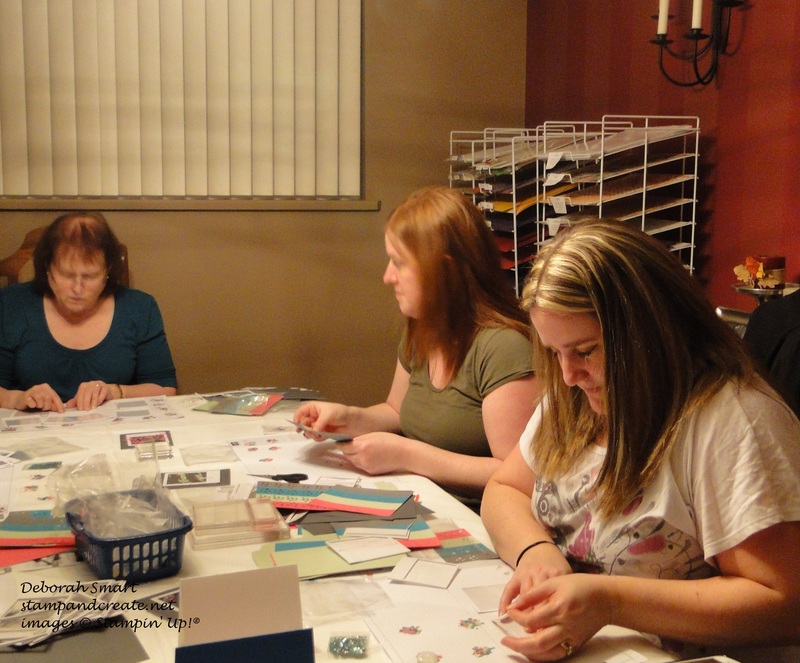 So, my ladies signed up, I order a refill kit for each of them – and we got together to stamp & create – and have fun! Okay – no giggles right there – everyone was concentrating too hard! One of the great things about the Paper Pumpkin kits is that even after you’ve made the projects in the kits (in this case, cards), you still have the stamp set and ink spot – which are exclusive to the Paper Pumpkin kit; you can’t buy them in any of the catalogues – to reuse for later projects, but you also have lots of left over die cuts, negatives, and other bits to use for making other cards or projects! Isn’t this cute? And it was super quick, because I had everything there already! 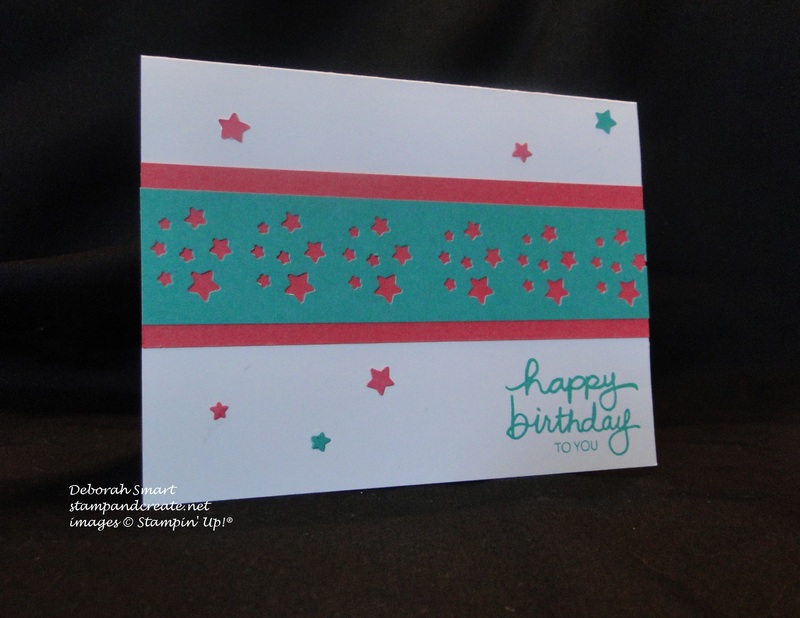 Okay – I did add the Strawberry Slush card stock behind the negative of the stars die cuts, and the Bermuda Bay ink for the sentiment – but that’s all! Tomorrow I’ll be back to share with you more new products – the Butterfly Basics stamp set, and the Butterfly Thinlits Dies. A great combination!! Previous Previous post: Ready; Set….Sale-a-bration! 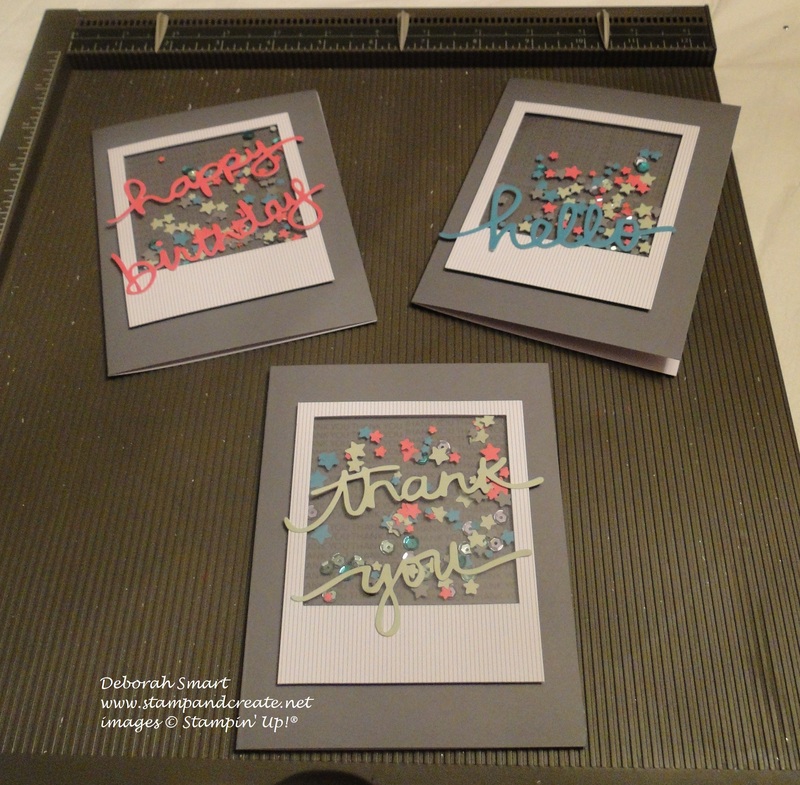 Next Next post: Butterfly Basics meets Paper Craft Crew Challenge!